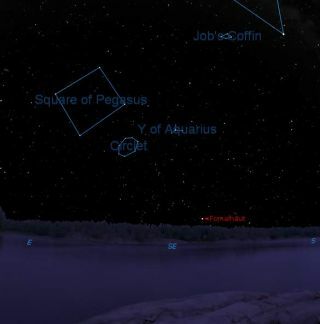 SKY MAP: The sky at 9:30 p.m. local time from mid-northern latitudes. Depending on where you live in the Northern Hemisphere, autumn officially arrives this week: either on Friday, the 22nd or Saturday the 23rd. Over North America, for instance, those who live in the Eastern or Atlantic Time zone will celebrate the autumnal equinox on Saturday. At 12:03 a.m. EDT (or 1:03 a.m. ADT), the Sun will appear overhead from the equator, and will be shining equally on the northern and southern hemispheres. For those living farther to the west, however, the equinox will arrive before midnight, on Friday (for instance, 11:03 p.m. CDT for Chicago; 9:03 p.m. PDT in Los Angeles). Summer nights are typically hazy, but now, at this time of the year, football weather brings the promise of many clear, dry nights with far better observing conditions. The most southerly of all the first magnitude stars visible from mid-northern latitudes and the one that is usually associated with chilly autumn evenings is the bluish-white star Fomalhaut, the brightest twinkler of the constellation of Piscis Austrinus, the Southern Fish. This week, at around 8 p.m. local daylight time, you'll see it shining sedately low above the southeast horizon. And just before midnight, it can be found low in the sky almost due south. The name is derived from the Arabic Fum al Hut, the "Mouth of the Fish." An alternate name was Al Difdi al Awwal, "The First Frog." In ancient legend, as recorded by the poet Aratos, the fish was on its back. A relatively modern legend suggests that Fomalhaut symbolizes the New Testament story of St. Peter and the coin found in the mouth of the fish. Draw an imaginary line southward along the western (right) side of the Square of Pegasus and three times as far again beyond will bring you to Fomalhaut. It is one of our closer neighbors in space, just 25 light years away and 19 times more luminous than our Sun. Fomalhaut was also known to the stargazers of ancient Persia as the star announcing the arrival of autumn weather. But unless you live in the southern states or points south, you can forget about seeing the faint stars that compose the rest of this constellation. Although now at their highest point above the southern horizon, more often than not they are too dim to penetrate the haze, which often lies near the horizon. Fomalhaut usually appears as the one lone star in this very dull and unexciting region of the sky. In fact, it is sometime referred to as "The Solitary One," because it lies in a rather empty region of the southern autumn sky. Yet it was also an important star to the ancients being one of the four "Royal Stars" of Persia, along with Aldebaran of the wintertime sky, Regulus of spring and Antares of summer. A recent photograph taken by the Hubble Space Telescope has provided the most detailed visible-light image ever of a narrow, dusty ring around Fomalhaut. It offers the strongest evidence yet, that an unruly and unseen planet could be gravitationally tugging on the ring.